We were at the office the other day and Sophia was watching The Little Mermaid and I noticed her singing a little and doing everything Ariel was doing so I grabbed my phone and recorded her. The end is what is the funniest part of the whole thing. You may have to turn your sound up some. 3 bedroom, 1 1/2 bath, brick home where a lot of love has lived! Finally you guys, finally, after what seems like an infinite amount of blood, sweat, and tears, we did it. Our sweet home on Kessler is for sale! It was officially on the market as of yesterday, but can you believe we've already had 3 different people come and look at it?! We're trying not to get our hopes up right now, but that certainly seems promising! I just hope that whoever lives here next makes as many memories in this little house as we have. We came home as husband and wife here, both our babies were brought home from the hospital and laid down to sleep here. I will not let go of this place lightly, but it's time for a change. My children are no longer like tiny teacup poodles, but more like Saint Bernards. They need a place to bark as loud as they want and room to run without fear of being run over! And nothing would make me happier than to give that to them. Here are some pictures I took after Mr. Mason, our realtor, put the sign in the yard. On second thought, buy the house and I'll throw in the kids...they know not to play in traffic. Several weeks ago a card came home with Sophie from Mother's Day Out advertising a "Fairyland" portrait session with Dixon Photography. I was so all over it. 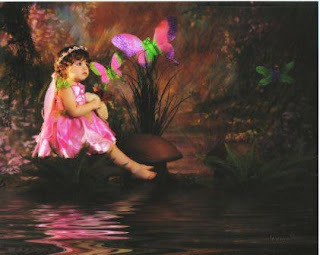 I love fairies, and for a long time I've known that if I ever had a daughter, I would decorate her room in a fairy theme. So for me, this was a dream come true. I would get her picture made dressed as a fairy, frame it, and hang it in her room as the centerpiece for the whole shebang! So I set up the appointment, took Becs with me for support and damage control, and we got started with the session. Sophia was soooo pretty dressed in her little pink fairy dress, iridescent wings and tiny flower crown....I was eatin' it up!! She, however, was not. Those of you who have experience with two year olds know what I'm talking about here. The concept of "stranger danger" is foremost in their mind when confronted with new people, and my daughter was on high alert. To say the very least, she was a very angry little fairy. Chrystal, the photographer, finally suggested that Becca and I step out and wait. She said it would be tough to take at first, but that she would finally settle down. So we did...and it was...but she did! After several minutes of some terrible noises I didn't even know such a small person could make, I began to hear giggling...and then camera clicking! So after what was probably the most traumatic portrait session known to man, we were done. And just look at our precious little flower fairy!! 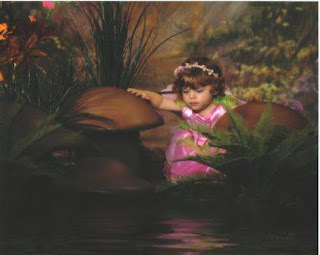 The one where she's crouching behind the mushroom looking into the pond is the one I picked out for her room. Pshaw!!! These chumps got nothin' on MY hero!! Happy 31st birthday, Larr! I love you! For Christmas Christi got me the Guitar Hero World Tour for my play station. A couple of months ago I got a second guitar to go with it so two people could play at a time. I now have a new awesome band member to play with!! Aidan has always loved watching me play and now I have started letting him play. He keeps getting better and better. Our band name is, for those of you familiar with Bill and Ted's Excellent Adventure,......Wyld Stallyns!!!!! I have a clip of us playing a song if you want to check Aidan out!! Well, here we go. I've finally got the party post ready to roll! And what a great party it was! Sophia's favorite TV show is The Backyardigans, so that's the theme we went with. For all you parents out there who aren't familiar with the little group, I urge you to get acquainted. They're really funny, and the music (I'm embarrassed to say) is quite catchy! We had the party in the gym at Larry and Denise's church, which was perfect. We set up play tents, slides, put out some crayons and play-doh, and the kids had an absolute ball. There was a cupcake cake, cookies, juice, and sodas. And as usual, Sophie's friends and relatives spoiled her with gifts and declarations of love. She's such a princess!! And she's so very lucky. Here are some pictures from the day. Love you guys! A visit with St. Nick!! !